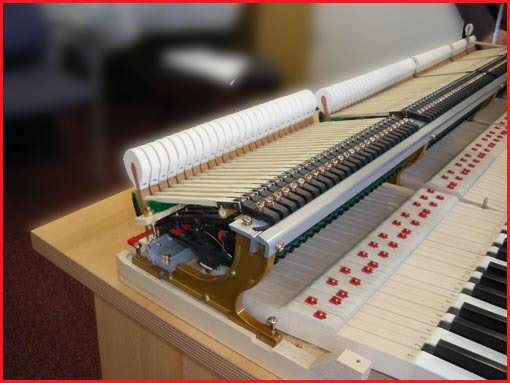 Servicing a piano involves making various adjustments to the mechanism and keyboard parts to gain optimum performance. be carried out every 2-3 years. 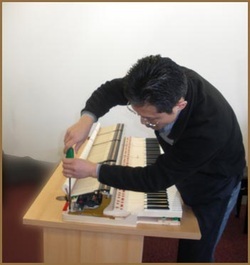 If your piano does not play, or cannot be tuned properly, it will need to be serviced. If a note is not working, it will need to be repaired first, then adjusted, then tuned. We can also adjust the tone of your piano for a warmer sound. Where inside is your piano serviced....? 1. This area is where your piano is tuned - recommended every six months. The tuning pins are turned by a lever to put your piano back in tune. mostly serviced and maintained (regulated). For more information about servicing your piano, please contact me. "Middle C is always out of tune, and sounds horrendous"
(Tuning visit 1): Single tuning pin is loose and will not stay in tune. Attempt to drive the pin in a little for more torque. Re-tune the offending string with the other two strings. (Repair visit 2): Tuning pin loose / pin driven in previously during "Tuning visit 1" / won't stay in tune. 1. Mechanism removed. 2. String lowered of tension. 3. Larger tuning pin replaced on old string. 4. String tuned. If the existing old strings will re-tune during visit 2, it will need to be tuned again in a few days. If an old "treble" string breaks during visit 2, it can be replaced, and will require a series of separate tunings, or the new string can be muted off until the next tuning visit. If an old "bass" string breaks during visit 2, the string will need to be sent away for a new bass string to be made. Visit 3: Fit new bass string & pre-tune, followed by several top-up tunings if needed. If a piano tuning is only partly successful, this could be a number of things stopping the tuning from completion. 1. Loose tuning pin or a series of loose pins (as above). at regular intervals.... this is separate to a piano tuning. further regulation tests are done to ensure the piano plays perfectly. further tests, then the piano is tuned.